This fall, we’re bringing together over 2,000 diverse thinkers and Lean Startup practitioners from all over the world to San Francisco to share ideas and projects that are shaping the future of business during Lean Startup Week. The conference is a gathering for entrepreneurs, corporate innovators, and thought leaders from across sectors and structures, and features the best of the Lean Startup community. Whether you’re new to Lean Startup methods or have been putting these practices to use in your organization, this event promises to educate and inform—and you don’t have to be in San Francisco to experience it. We’re inviting you to join us as part of the livestream community, where you can experience the main conference days, Nov. 2 & 3, with your local entrepreneur community. While knowledge about the science of entrepreneurship has gone global, startup ecosystems are always local. Come to weXelerate at 2nd & 3rd of November, 2017 at 5pm to meet fellow Viennese entrepreneurs interested in creating and managing successful startups, free of charge. 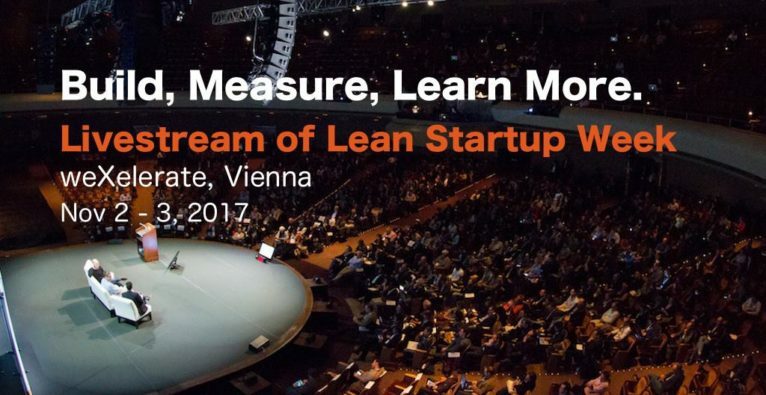 To learn more about the conference and its speakers, visit Lean Startup Week at https://2017.leanstartup.co/. Read about the Lean Startup movement and principles: http://theleanstartup.com/book. Tickets und Infos unter Lean Startup!